Who is a fan of hard boiled eggs? We are! 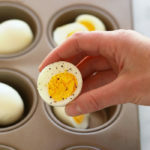 There are so many ways to prepare hard boiled eggs, but making hard boiled eggs in oven is the easiest way to meal prep hard boiled eggs for breakfast, a healthy egg salad, or for an easy snack throughout the week. 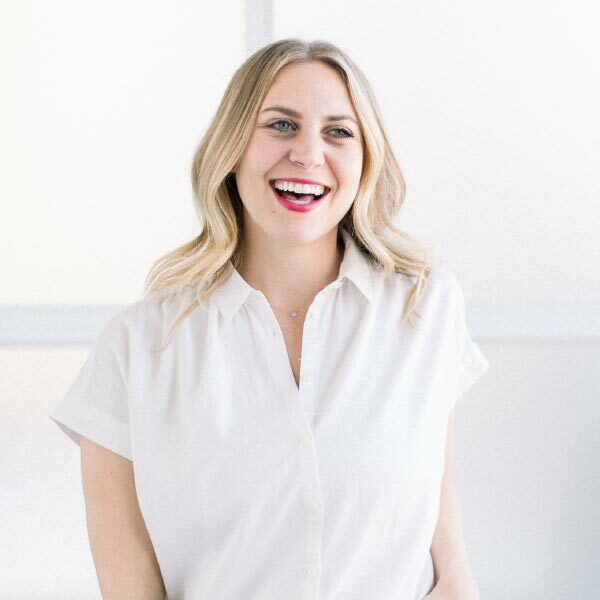 Let’s chat about how to hard boiled eggs in the oven! 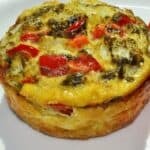 We love eggs here on Fit Foodie Finds and we do our best to keep you all updated on the easiest ways to prepare eggs. Why do we like eggs so much? 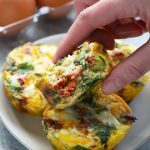 Eggs are an excellent source of protein, they are absolutely delicious, and are easy to incorporate into meals for any time of the day! It is not our first time around the block when preparing eggs, we have baked eggs in the oven in our How to Bake Eggs in the Oven. 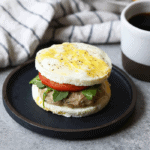 We’ve used our Instant Pot to make Instant Pot Hard Boiled Eggs Meal Prep Breakfast. 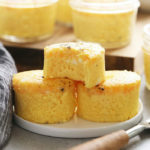 Most recently, we’ve used our sous vide to make these Cheesy Sous Vide Egg Bites. you just can’t go wrong! Today, we are talking about the baked hard boiled eggs in the oven and we are so excited about it! 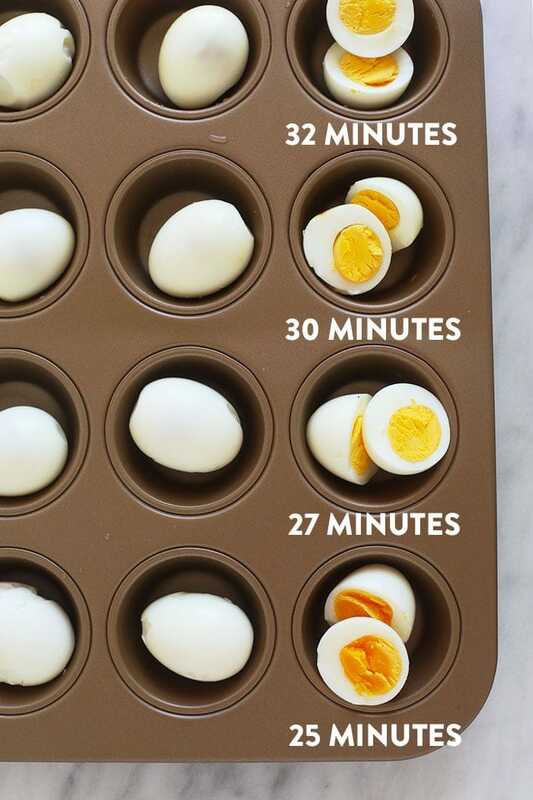 Don’t worry, we have tested different bake times for our hard boiled eggs, because we know that everyone likes their eggs a little bit different. But first, let’s answer the most frequently asked quesitons about hard boiled eggs! How hot does the oven need to be to make hard boiled eggs in oven? To bake hard boiled eggs your oven should be at 325ºF. What can you make with hard boiled eggs? Hard boiled eggs make the perfect easy breakfast in the morning or the perfect high protein snack during the day. However, there are so many recipes you can make using hard boiled eggs as an ingredient. 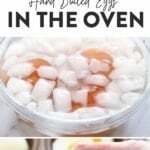 Baking hard boiled eggs in oven makes it easy to have eggs on had to make delicious egg salad recipes or a cobb salad! How long can you keep hard boiled eggs in the fridge? 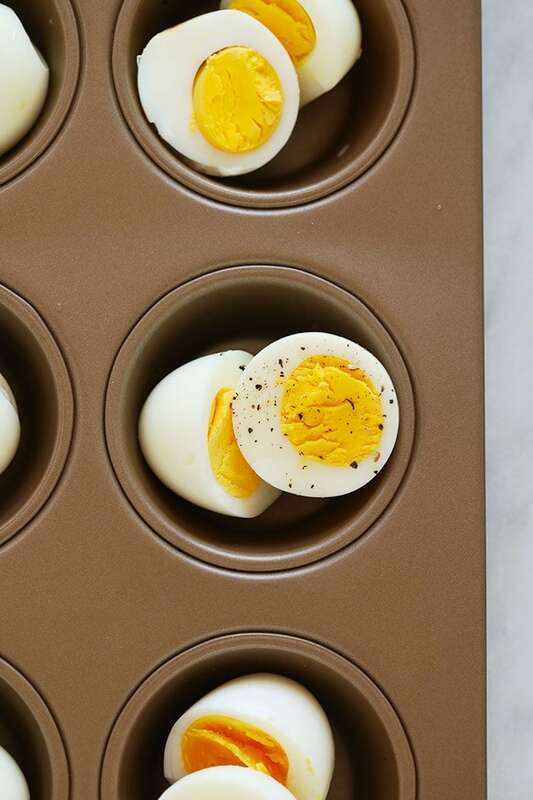 We love meal prepping hard boiled eggs and storing them in the refrigerator in stasher bags or meal prep containers. You can leave hard boiled eggs in the fridge for up to a week and you can leave them with their shell on or peel them. Just make sure to let them completely cool before storing them in an airtight container. 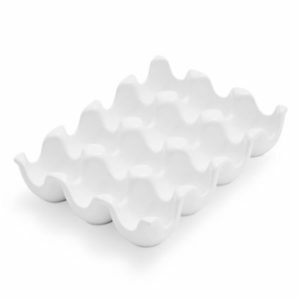 Incredible Egg goes into more detail on tips and tricks for egg storage! 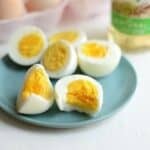 Whether you are new to the hard boiled egg world or have been peeling and dealing your whole life, there is always something new to learn about how boiled eggs. Here are a few tips and tricks we keep in mind when making and preparing hard boiled eggs. Set a timer Whether you are hard boiling eggs in the oven, over the stove, or in the Instant Pot, the key to perfect hard boiled eggs is keeping track of how long they are cooking. Remeber that just because you remove the eggs from the hot water, doesn’t mean they are done cooking. In order to prevent the eggs from cooking you must run them under cold water and set them in an ice bath. Let the Soak Not only will an ice bath help stop your eggs from cooking, but it will make the peeling process a heck of a lot easier. 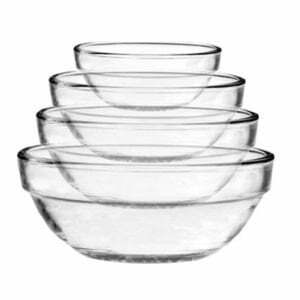 When your eggs are almost done cooking place a 1/2-1 cup of ice into a large bowl and fill the bowl with cold water. When eggs are done cooking, place them into the ice bath and let sit for at least 5 mintues. Make Peeling Easier The most annoying part of eating hard boiled eggs is peeling them! If you’re having a really good day, your hard boiled egg peels easy and you are done in under a minute. Other days you end up with an egg that looks like a huge moon crater and you’re peeling forever. To make peeling easier, soak eggs long enough in the ice bath. If that doesn’t help, turn on your water faucet to a slow trickle and peel your egg underneath running water! 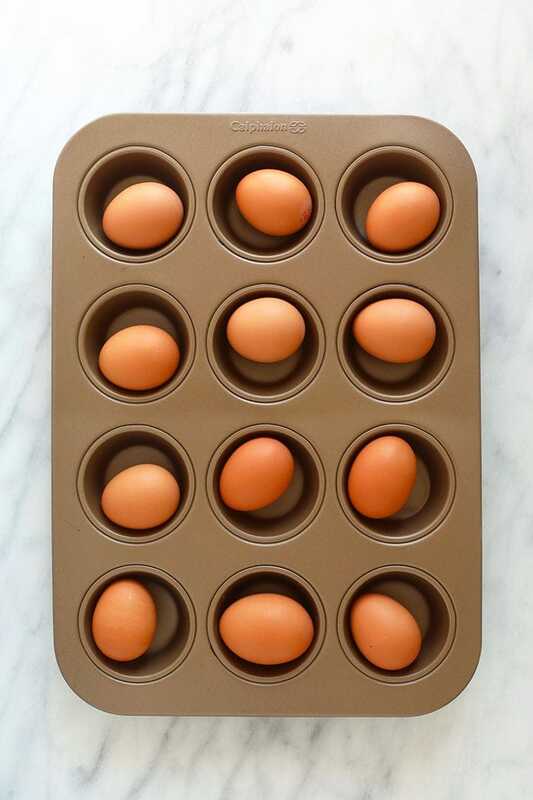 Hard Boiled Egg Storage You can store your eggs peeled or unpeeled. However, because eggs tend to have that egg-y smell, we recommend storing all hardboiled eggs in an airtight container at all times. Eggs will keep for up to a week in the refrigerator. Hard Boiled Egg Snack Ideas Enjoy your hard boiled with hummus on a healthy charcuterie, on top of avocado toast, as a part of a protein plate with sausage and fruit. The options are endless! 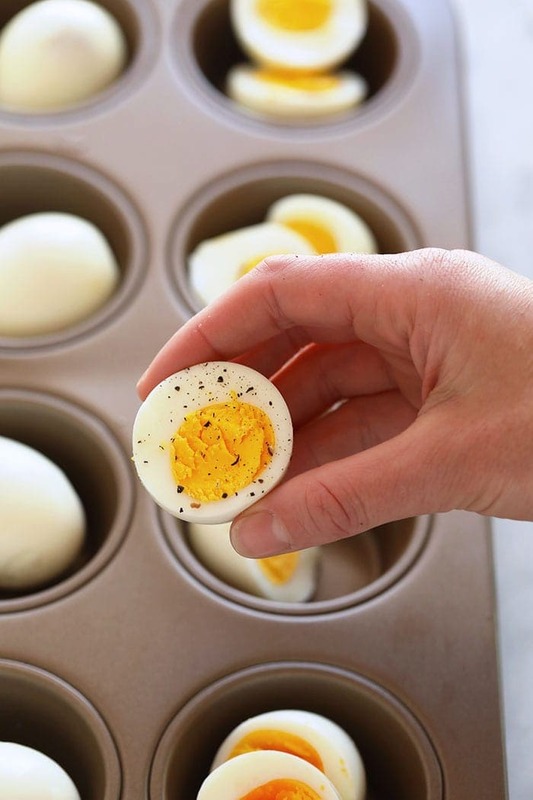 Hard boiled eggs in oven is the as easy as 1-2-3. 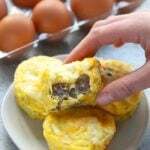 All you need are eggs and a muffin tin. 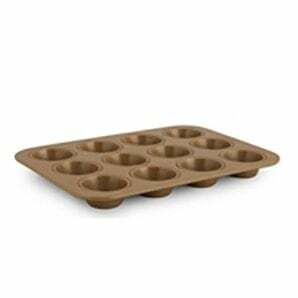 Honestly, you could probably even use a cake pan or a cookie sheet if you don’t have a muffin tin on hand! 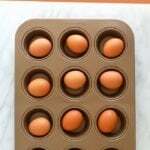 We love using a muffin tin because it keeps every single egg in its own little nest, safe from any harm. Just like any other egg recipe, there are many different yolk consistencies to consider when you are cooking hard boiled eggs in the oven. Are you a runny yolk kind of a person or do you like your yolk hard and almost chalky? We know there are both people out in the world, so we decided to let you decide how you like your eggs by testing hard boiled eggs in the oven at different bake times. If you are looking for runny soft boiled eggs, you won’t find that here. We went for soft and jammy on the lower cook time and fully cooked on the longer cook time! 25 Minutes- Soft, jammy, and the perfect deep orange color. The 25-minute egg is a harder to peel then the rest of the other eggs, so make sure to let it soak long enough in the ice bath. If you are looking for a hard boiled egg that still has a little shine from the yolk, 25 minutes is your time. 27 Minutes- The perfect yellow and fully cooked yolk. The 27 minute egg was still a bit difficult to peel, so let the eggs sit long enough in the egg bath and be patient when you peel the egg. If you would rather have an egg yolk that is fully cooked, but still has a moist texture, 27 minutes is perfect! 30 Minutes- Fully cooked, no moisture and easier to peel! The egg white has hardened a bit more and the shell comes off a heck of a lot easier. If you need a fully cooked egg with no chance of any moisture, 30 minutes is the egg for you! 32 Minutes- Hard with no possible sign of wet yolk. Have no fear, if you are one of those people that wants nothing to do with a wet yolk, this is your egg. A major bonus of baking a hard boiled egg for 32 minutes is an easier peel! We found that the 32-minute egg was easier to peel then the rest! First, preheat oven to 325ºF. 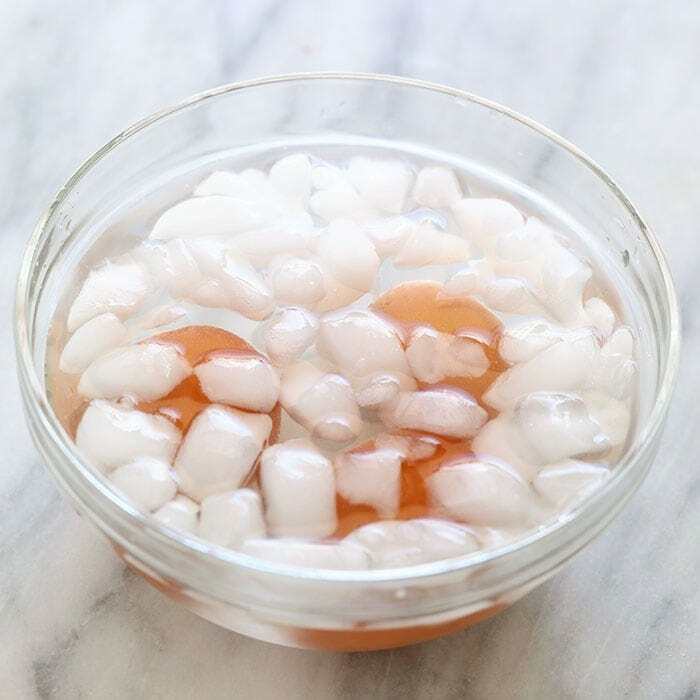 Remove eggs from the oven and immediately place into an ice water bath for 10 minutes. This will make the eggs easier to peel. Lastly, remove from ice bath and peel eggshells off of the egg and enjoy! 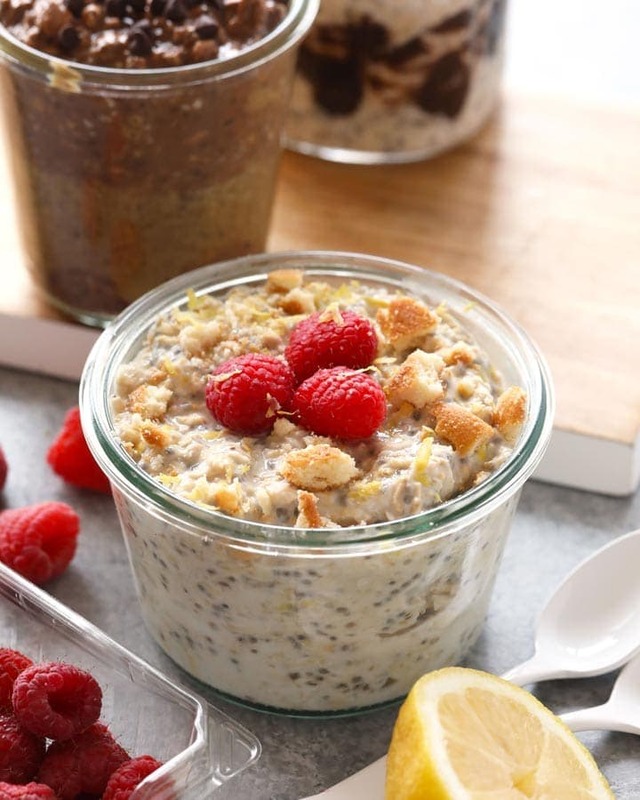 Store in an airtight container or stasher bag in the fridge for up to 3-5 days.